If you need a portable garage to protect your vehicle from the rain and direct sunlight, then you may consider purchasing a carport. Indeed, the carport is portable, easy to install, and can be deployed anywhere you want to. In addition, it can easily be carried on the spot for installation. If you need quick and immediate protection for your vehicle, the carport is the ideal choice. Best, most top-rated carports have a wide coverage area of at least 200 square feet so it will have no problem accommodating a big vehicle like a truck. The Abba Patio is a popular carport model that has a universal design. 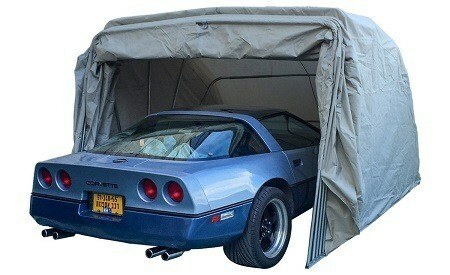 By this, we mean that you can use it as a regular carport all you can use it as a canopy tent if you so desire. Moreover, this carport is very durable because it is made from a double polyethylene material that is literally glued together by heat. This extra thick carport will be able to withstand the elements like sunlight or rain with great ease. It will definitely not degrade over time. It also offers you excellent coverage because it has a coverage area of 200 square feet which is big enough for most vehicles. All in all, if you are looking for a versatile and a high-quality carport, then we seriously recommend you consider the Abba Patio because it is really worth the money. If you require full protection of your vehicle, then the Ikuby Super is definitely the right choice. It is a fully enclosed carport which means that it will offer absolute protection to your vehicle on all sides, including the roof. Moreover, one distinctive feature of this carport is its small form factor. It is also quite lightweight so you can easily carry and deployed anywhere you desire. When it comes to installation, then this model is perhaps the best portable carport in this review because it is extremely easy to carry and install. Simply lay it on the ground, and it is ready for use. There are no complex installation procedures with this model. Few models in this carport review can compete with the Palram when it comes to durability. Indeed, since this carport is made from a polycarbonate material, it is virtually indestructible. Furthermore, the steel framework provides this carport with a solid foundation, so you do not have to worry about snot accumulating on its roof. It will be able to withstand almost anything, from thick snow to hail. Sure, it takes a little bit more work to install this carport because it is considerably heavier and more robust when compared to others. But the effort is well worth it! If you have a big vehicle to install but do not have a lot of money to invest in a carport, then the King Canopy is an excellent model to consider. It is made from a heavy-duty polyethylene material that is fully waterproof and weatherproof. Furthermore, this material will be able to repel any UV rays as well as protect your vehicle from a rain shower. It is also fire retardant which is very important especially for carport. No problem there. Moreover, due to the open design of this carport, it is a well ventilated and will prove to be especially useful on a hot summer day. 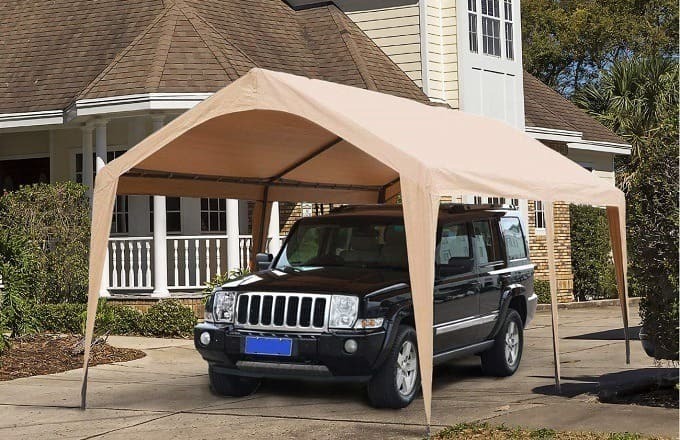 All in all, even if this model is not the best-looking model we have seen, it still remains one of the best carport canopies that you can buy, especially if you need a large open space carport for your vehicle. The Delta was made for owners of big vehicles. 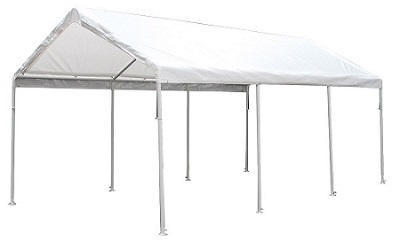 Indeed, this canopy measures an impressive 20 feet in length and 12 feet in width. With such a big size, it will have no problem accommodating even the largest vehicles on the market. Furthermore, since it is made from a heat-bonded polyethylene, it is quite durable and will last a long time. This is simply multiple layers of polyethylene that have been glued together with heat. They are tougher than your average carport material. 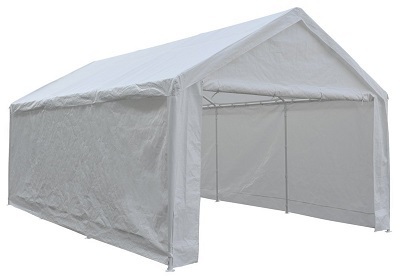 In addition, this carport is very easy to use as it has a double-zippered front. You can quickly and easily close the front of this carport and make it become enclosed for better protection and privacy. But what makes this model really different is its strong galvanized steel frame. It is robust and will not bend under the weight of the canopy. 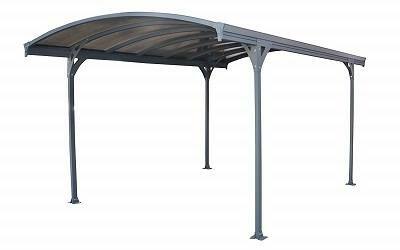 This solid frame easily makes this unit one of the best metal carport that you can buy. 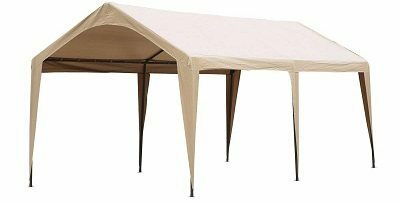 This is a popular model by King Canopy. It is made from a patented drawstring cover that is very durable and offers excellent resistance to UV light. This model will have no problem remaining under direct sunlight for an extended period of time. It will certainly not degrade over time. In addition, it is big enough with a coverage area of 200 square feet, so it will be able to comfortably accommodate big vehicle like a truck with ease. With its 6-leg design, it is extremely easy to install, and since the top of this carport is triangular, it will not let snow all water accumulate. But what we really like about this high-quality carport is definitely its affordable price. Indeed, when viewed from a price standpoint, it is simply unbeatable because it is the cheapest solution in this review. We have already covered other Abba Patio models in this carport review. However, this model is bigger since it has a width of 12 feet and a length of 20 feet. This provides it with an impressive cover area of 240 square feet. So, this carport will have no problem to accommodate a big vehicle or even multiple vehicles like motorcycles with ease. It is made from a thick polyethylene material that is extremely durable. Furthermore, the steel frame has been white powder coated, so it is not only aesthetically pleasing but also extremely tough. The footpads are also enlarged, so they offer better stability on almost any type of terrain. But best, you can close the front of this carport with its double zipper for better security and privacy. First and foremost, you must ensure that you have the right carport dimensions for your vehicle. Not all vehicle needs the same carport size because evidently, not all vehicles have the same size. Therefore, before purchasing the carport make sure that you measure your vehicle and add at least 20% of the size of your vehicle to the carport. For example, if your vehicle has a coverage area of 180 square feet, then go with a carport model that offers at least a coverage area of at least 220 square feet. Since the carport is exposed to elements like direct sunlight and rain, it is very important that it is made from a heavy-duty and extremely durable material. Most top-rated carports that you will find on the market are made from a polyethylene material which is very durable and long-lasting. In addition, polyethylene is also a fire retardant and will not degrade over time. Of course, there are other materials like polycarbonate panels that are more aesthetically pleasing than a carport made from polyethylene. However, a model from polycarbonate panels will definitely cost you because this is a quite expensive material. Many carport models come with an inbuilt ratcheting system. What the ratcheting system does is to quickly and easily adjust the tension of the carport material so that you can securely install it. The ratcheting system is extremely easy to use because all you have to do is put laces between the ratchet and attach it to the canopy. Then, by simply moving the ratchet up and down, you tighten the lace which in turn tightens the carport fabric. It is extremely beginner-friendly and allows you to install your carport in a much safer manner. In addition, ensure that the ratcheting system of your carport is made from a corrosion-free material like steel. It must also be heavy-duty and not break easily. 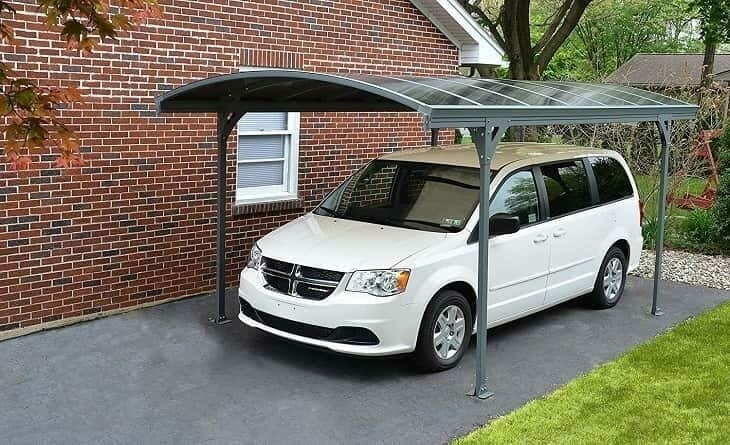 The whole point of the carport is a protection to your vehicle. There are a few factors that make a carport protect your vehicle. For one, the material used in the carport must be heavy-duty and durable. You do not want a carport that is made from materials that start degrading over time. It must be fully weatherproof as well as a waterproof. Moreover, there are several types of the carport. If you only want protection from direct sunlight and the rain, a traditional carport with only a roof will suffice. On the other hand, there is a model which includes protection for the roof as well as the side of your vehicle. If you need that kind of enclosed protection, then you can go with a carport model that closes on itself and provides a protective shell to your vehicle. The framework of the carport is basically what is structure and acts as a support base for your carport. Since it supports all the weight of your carport, it needs to be made from a durable and tough material like steel. In addition, the framework must also be easy to install, and you do not have to weld or require advance tools for its installation. 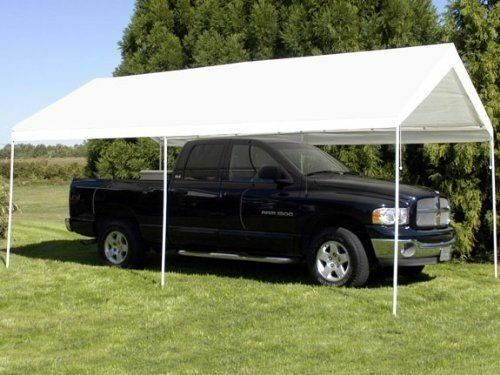 The carport protects your vehicle from the rain and direct sunlight. This is basically a tent that you can deploy anywhere in a matter of minutes. But one of the best things about the carport is its heavy-duty build construction material that makes it very durable and long-lasting. 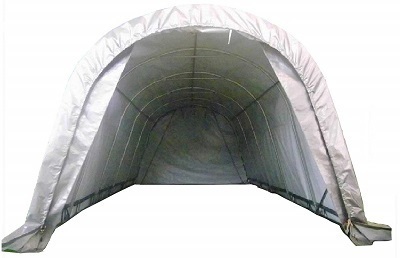 This is not a canopy tent that will degrade over time. In addition, it does not matter if your vehicle is small or big because you get a large coverage area with the carport. Therefore, it remains a worthwhile investment especially if your vehicle does not have a dedicated garage. Lastly, if you have not decided on a model yet, then read our carport review above.